Swaying palms… Pristine turquoise lagoons… Lush foliage… The happiest people on earth… This is Fiji. Weddings in Fiji are not only beautiful but are one of a kind; each experience created with only you in mind. The documentation needed to be married in Fiji: original birth certificates for the bride and groom, valid passport, if applicable divorce papers, if previous spouse is deceased a death certificate, and Certificate of Single Status (we will provide). Additional items may be required based on your country of residence. We walk you through the entire process to make it easy, seamless. Elle MacPherson and Jeffrey Soffer’s beautiful and one of a kind destination wedding took place at Laucala Island, located in Fiji. Couples, Honeymooners and Privacy Seekers can now enjoy their own secluded “Dream Beach” for the day! On the west coast of Laucala Island, Tadra Beach, or “Dream Beach”, is a secluded swathe of sand only accessible by sea and only available to one couple at any given time. Guests arriving by boat, catamaran or jet-ski can enjoy romantic picnics under the shade of indigenous trees, stroll along the deserted beach or delight in some of Laucala’s best snorkeling off Seagrass Bay. Guests of Laucala will enjoy total privacy… ask about organizing a Spa treatment and special picnic lunch on Tadra Beach! We will arrange the finest details for you in advance. 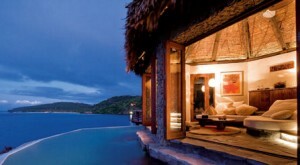 Among some of Laucala’s activities, private yoga instruction can be arranged. Guests can enjoy a private session in their villa, on the beach or at any other desired location on property. Private golf lessons with the Pro on the Championship David-McClay-Kidd 18-hole golf course, world-class surfing, jet boat snorkeling and picnic lunches… this is just the beginning of what Laucala Island offers their guests. 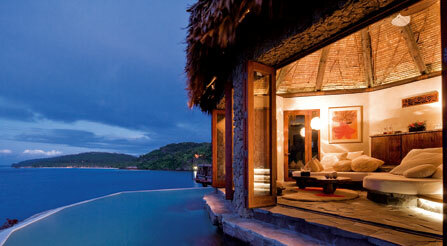 The world of all inclusive Laucala in Fiji awaits you…..inquire today! Remarkable Honeymoons is very happy to be affiliated with World Travel in Portland, OR. Through this affiliation we are partnered with Virtuoso, a luxury travel consortium that ensures all of our clients receive the best of care. Through this affiliation, we can provide upgraded accommodations at Laucala in addition to a 90 minute spa treatment per person. Call us (Toll free 1.866.614.1803) or request a quotation if we can be of assistance to you in the planning process. We enjoy what we do and look forward to the experience with you.